Welcome to Lauren's Designs Facepainting! I am glad you came to my site. Here at Lauren's Designs we offer quality art and great customer service. 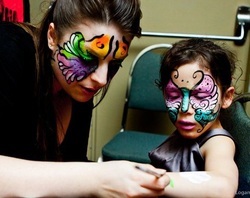 We offer face painting, body painting, quality art (for any room or window) art and drama lessons. All supplies used are clean and safe. We will entertain any guest, at eny event just for you; so you can sit back and enjoy the party. Only the creative and best designs will be there for you to enjoy. Contact us today to book an event or commission a piece of art. Lauren Givogue is not your typical Aquarius. She struggled through school, receiving her high school diploma was a huge achievement! After high school she decided to work in Early Childhood, using her abilities to take care of children. She is the eldest of four children and had been babysitting as long as she could remember. Givogue had gone to the highest level she could in the business, she was a Nursery Supervisor, overseeing up to 13 children under the age of 19 months, organizing daily schedules, training staff and making sure the room was clean and orderly. During the time she worked in the daycare business she decided she needed to go higher, she needed more responsibility. She studied at Mount Royal College and upgraded all her courses and applied to University. Studying at the University of Lethbridge and trying to make ends meet she worked at a local donair shop. With a creative side and an Art degree under her belt she was craving more. One day her Mom had brought up (in conversation) a cousin in Ontario who was doing Face Painting for a living. Hmm ... she thought there’s an idea. Givogue decided to buy her first set of face paints from a local Hobby shop. A six pallet of Wolf FX paints would take her through the next few months that would change her career. She went to a few festivals and Christmas parties and ever since she was hooked. She started investing in bigger and better products and some classes to improve her techniques. It is July 2012 and she is in her last semester of school. An under grad Bachelors of Art and Education. Her internship was with classes ranging from K-9. She has taught classes in the past such as: English Grade 4/5 and 7, Music, Art for all ages and more. 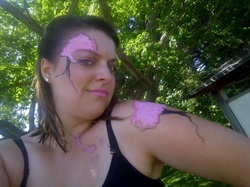 She is continuing to face and body paint to support her University Career. This artist and student loves her art and working with children. Currently working as a full time teacher in an elementary school since 2013. She continues to build her career as a professional artist and teacher. All of these achievements came from a girl who thought she may not even graduate, truly proves that if you put your mind to it you can do it! Hard work and dedication always win in the end.